Home » PROOF OF AN ALIEN COVER-UP? IS NASA TRYING TO STOP US FROM LOOKING AT THE SUN? Last week, UFO enthusiasts claimed they had — again — spotted an alien spacecraft flying near the sun. As these sightings are frequently written off with “simple explanations,” one rather interesting enthusiast is now accusing NASA of a cover up involving the giant ball of gas. 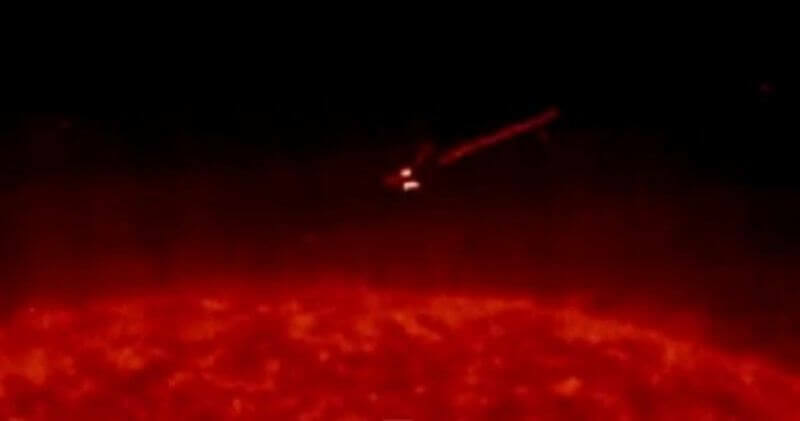 The Daily Mail reports YouTube user “rob19791” posted a video on May 5 based on images from NASA’s Solar and Heliospheric Observatory taken on May 3. The video shows an object passing above the sun. A couple days later, he alleged observation data of the sun, which is continually being beamed from SOHO to Earth, had been missing since May 4. NOTE: LACK OF DATA UPDATES. SOHO went again into “Emergency Sun Reacquisition” (ESR) mode on Wednesday, May 8, 2012 at 20:34 UT. The ESR was again caused by a false trigger of the Coarse Sun Pointing Attitude Anomaly Dector. We are working on the recovery of the spacecraft to normal mode. It will take several days to return to normal science operations. Watch rob19791′s May 7 video in which he explains his conspiratorial theory. SOHO was launched in 1995 as a collaborative effort between NASA and the European Space Agency to study the sun, its corona and outer atmosphere. The project was only supposed to last two years, but it has since remained in space observing the sun and providing researchers with data about solar storms and how they can affect Earth. Have any theories of your own?